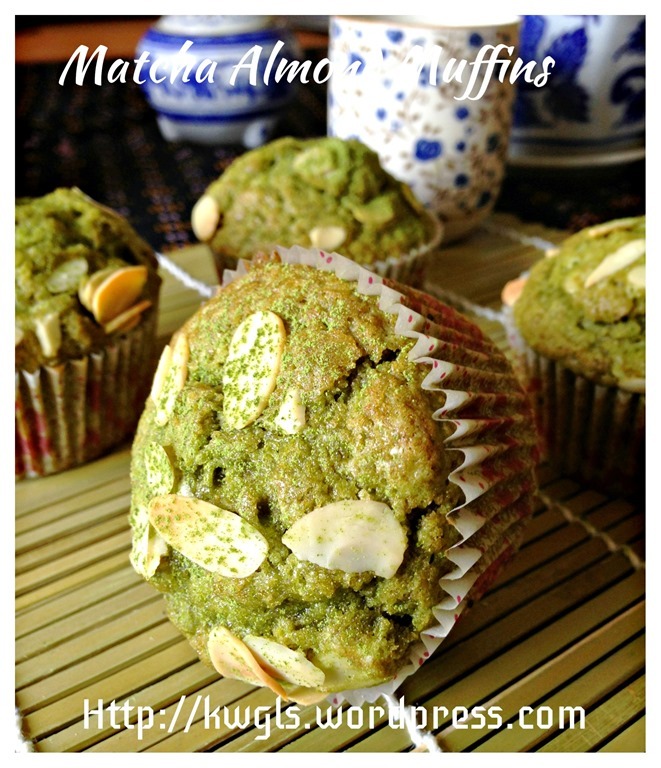 It is a pure, aromatic matcha flavour muffin and the fragrance was not masked by butter and eggs. 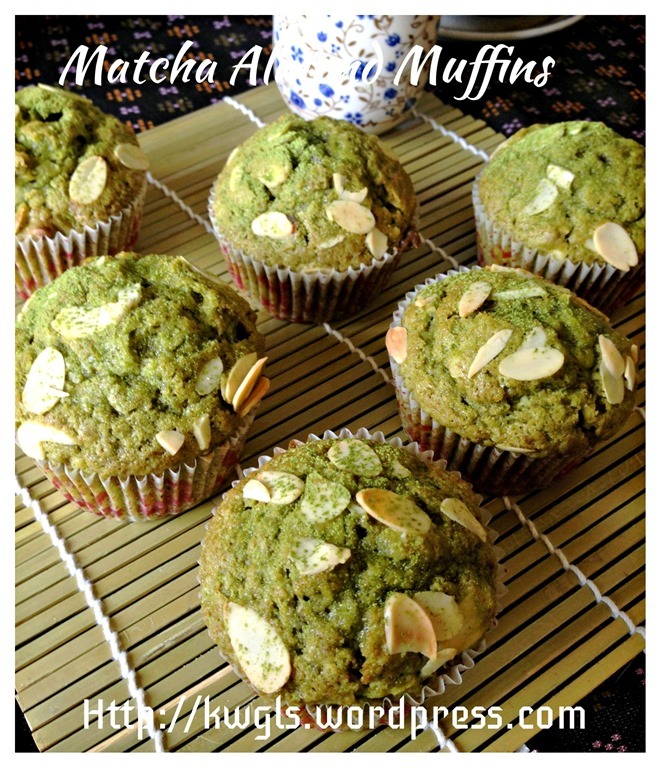 However, if you want to have eggs and butter fragrance, feel free to use my other earlier muffin recipes and add 1-2 tablespoons of matcha powder. 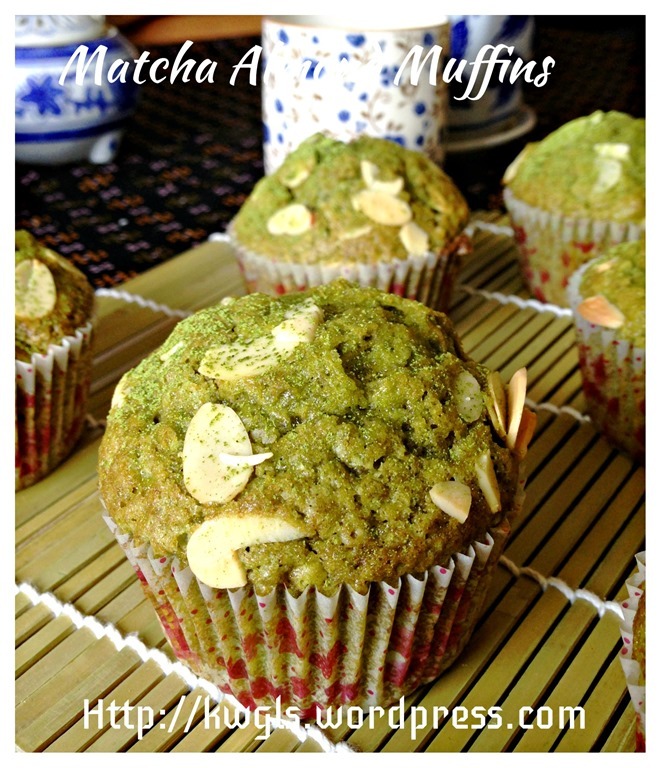 Then the matcha flavour will not be that distinct. I have to be frank that I am not happy with the colour inside the muffins. 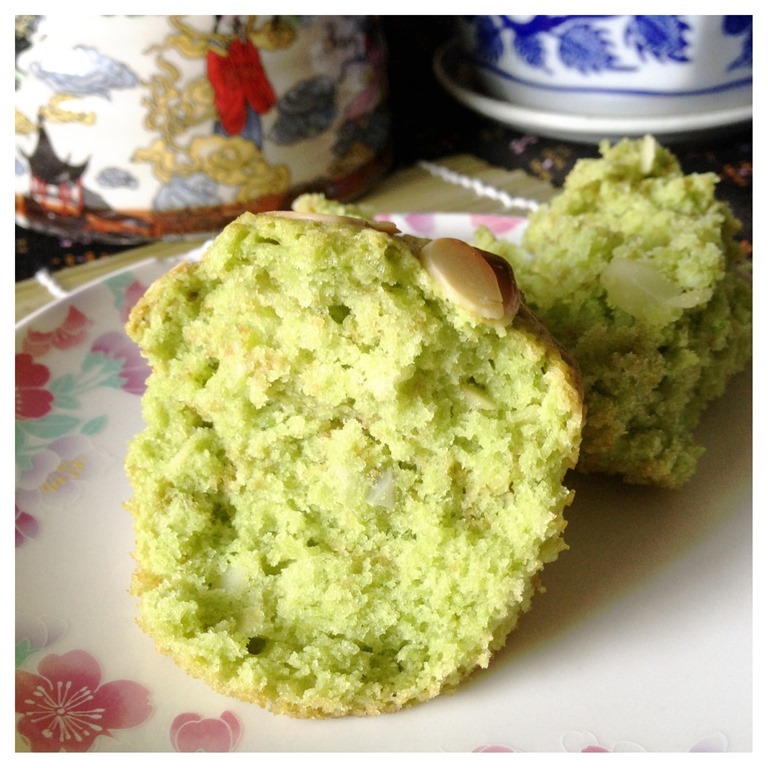 After baking, it turned slight brownish and I am puzzle why some of the images in the internet appeared to be bright green! Out of curiosity, I prepared another batch of muffins with a slight twist of adding 2 tablespoons of vinegar. Yes, the outcome is encouraging with a green interior. 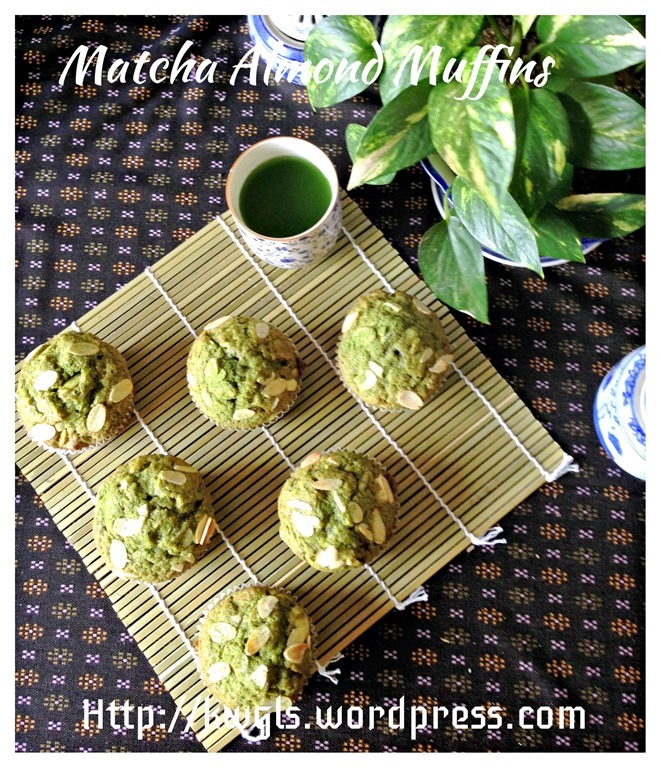 It somehow “confirm” my suspicion that without green colouring in the recipe, acidic medium like lemon juice or vinegar may be able to inhibit the oxidation of green tea and prevent colour changes. However, this shall not be construed as a confirmation since the experiment was not done in a scientific manner. In this recipe, I have adjusted to add 2 tablespoons of the lemon juice or vinegar to the batter and I hope that the final colour are greener than what is in my illustration here. Some may be wondering about whether the taste will blend! Surprising, the vinegar flavour is not distinct at all. It remain the same flavour as the first batch. 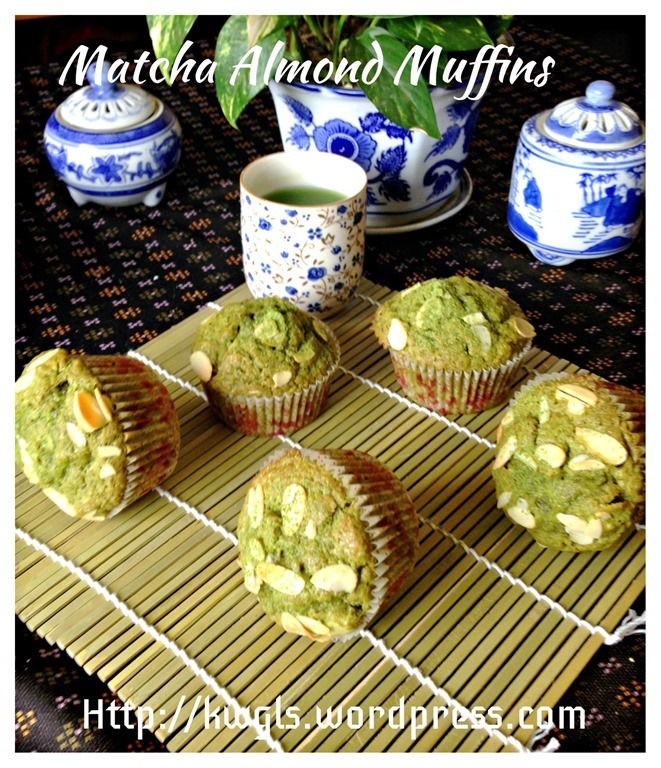 The muffins are healthier, definitely edible. 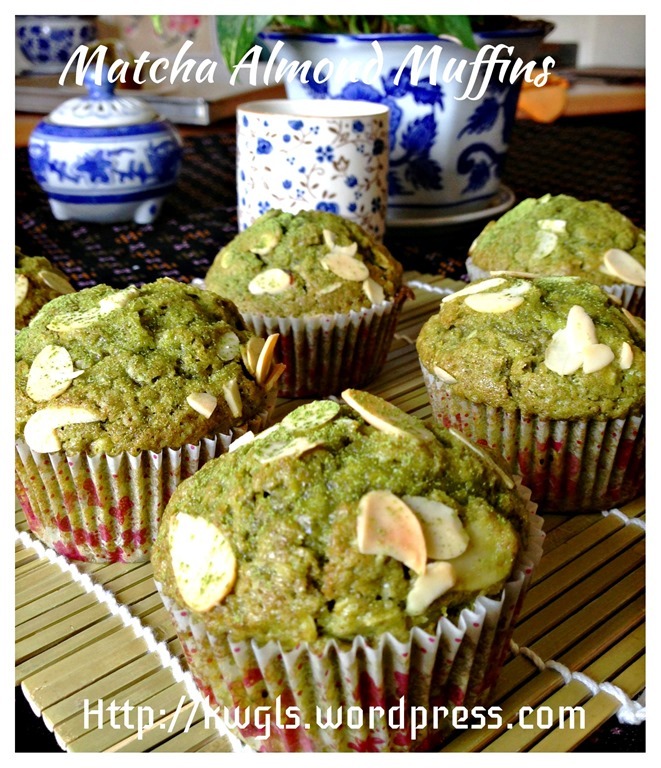 For those who prefer a stronger flavour, you can add additional 1/2 tablespoon more of matcha powder but I have to caution that adding too much matcha powder may make the muffins bitter. 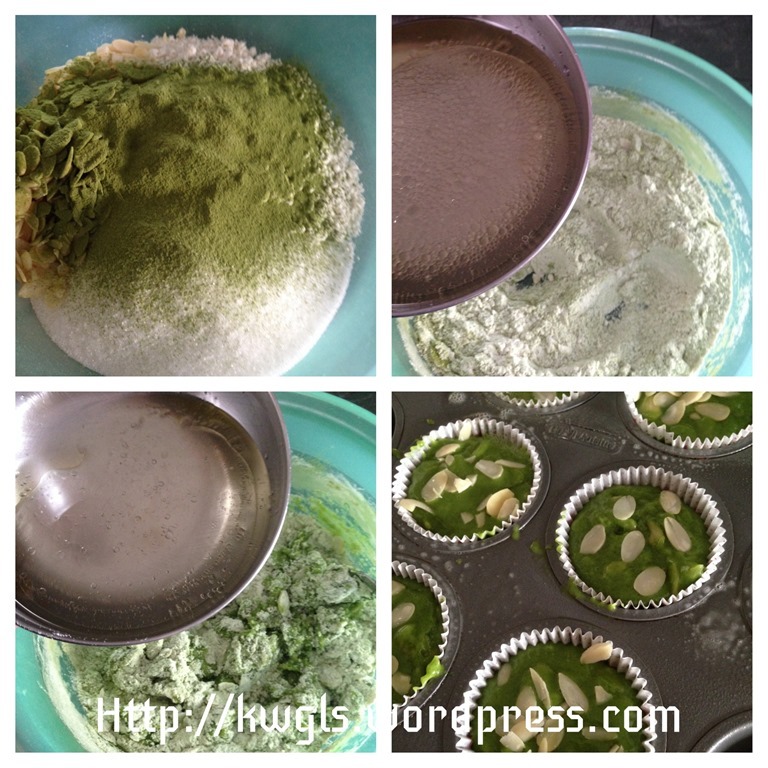 Shift the flour, baking soda and green tea powder in a mixing bowl. Add all other dry ingredients. Make a well in the centre. 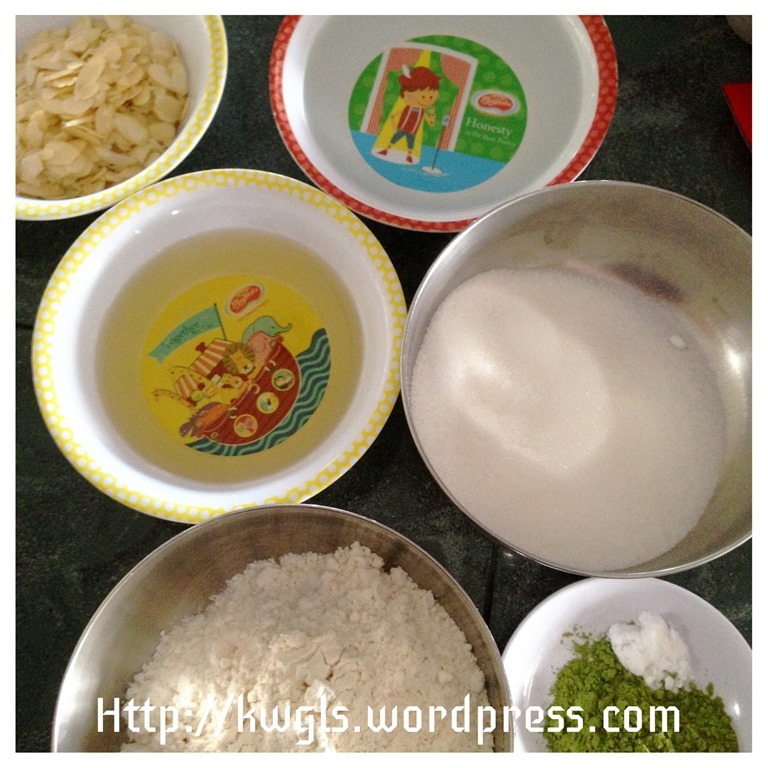 Add in the cooking oil and water in 3 stages. Use a knife or fork to lightly mix it. Slight lump is acceptable. Transfer to the cupcake cups and bake in the pre-heated oven of 170 degrees for 25-30 minutes until a skewer inserted comes out clean. 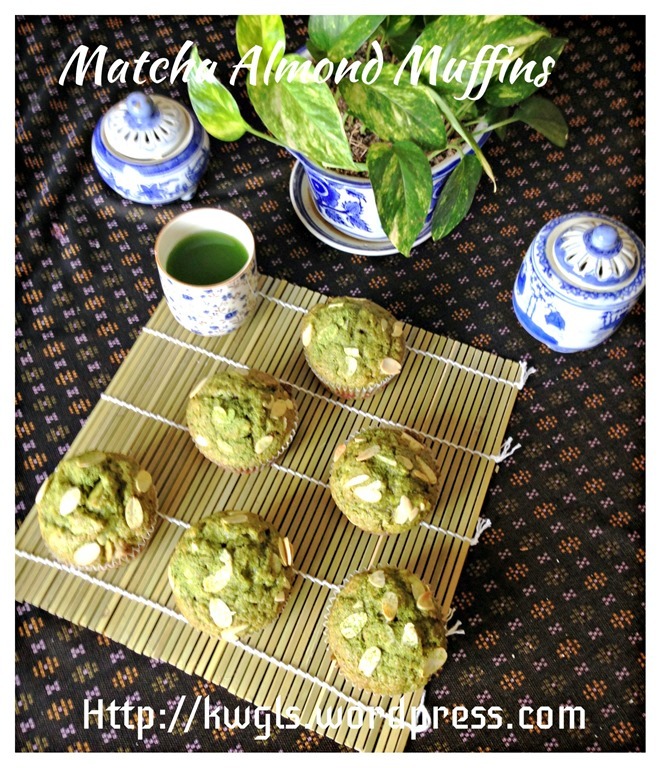 Note that timing will very much depends on the size of your muffins. Final test is the skewer test. 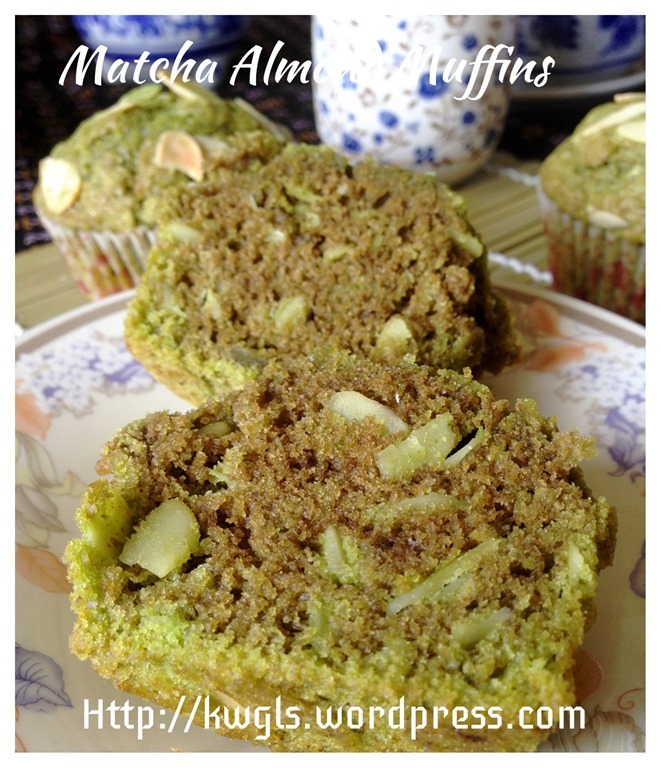 To avoid browning too fast, placed the muffins at the lowest rack of the oven. 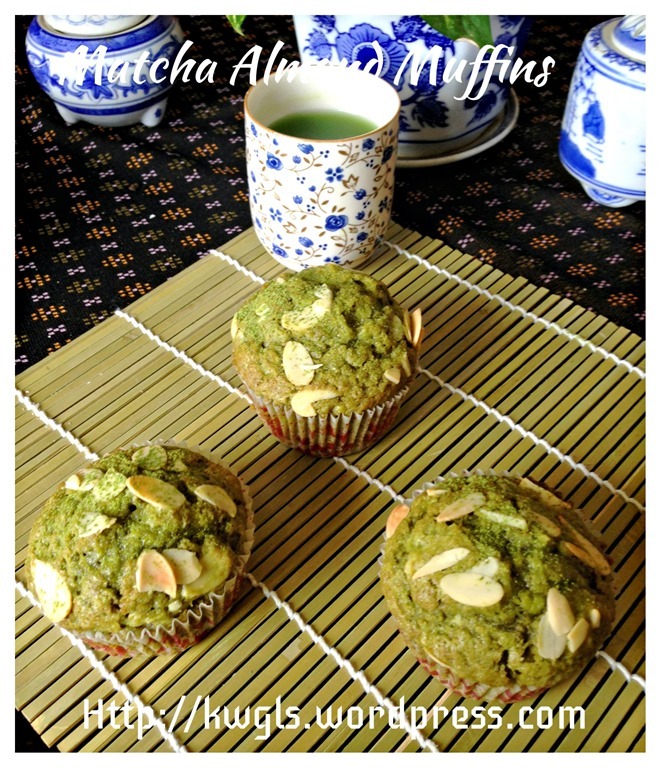 This entry was posted in Cakes and cookies, Food Preparation Series and tagged 8, Almond, 绿茶小松饼, GUAI SHU SHU, Guaishushu, kenneth goh, matcha, matcha almond muffin, postaday. Bookmark the permalink. Mr Kenneth may I check with you the ingredient prepared should be baking powder or baking soda as the method in number 2 showed baking soda. Your advice please thank you. Thanks for highlighting. It should be baking soda. I am sorry for my oversight. Have amended the post. I am so happy to come across this recipie of your’s as i’m on a strict diet and there are many things i cant eat. 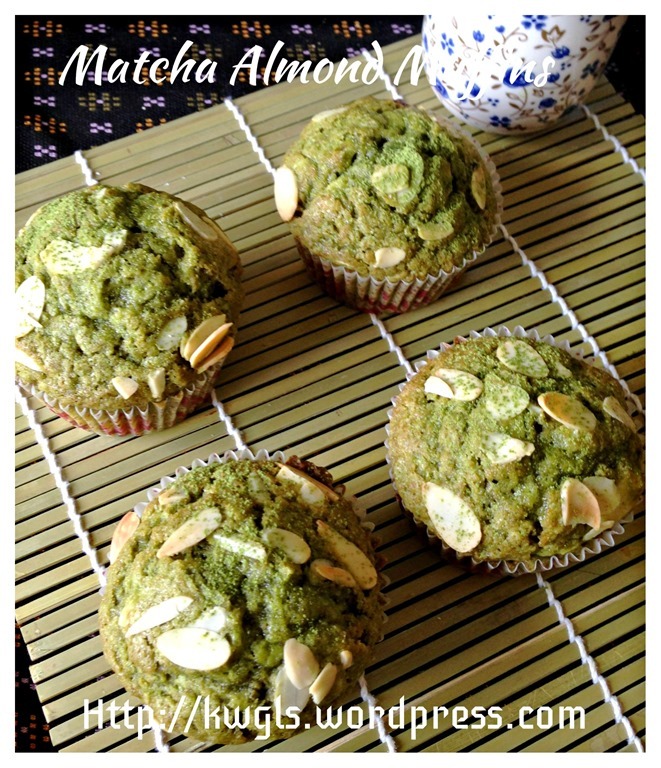 Can i ask where you got your matcha powder? Also for the cooking oil, do you think cold pressed organic olive oil will work or will it make the muffin taste weird. If i were to make it into a vanilla flavour muffin, will the measurement be still the same 1-1.5 tablespoon vanilla extract? Sorry to ask so many questions.